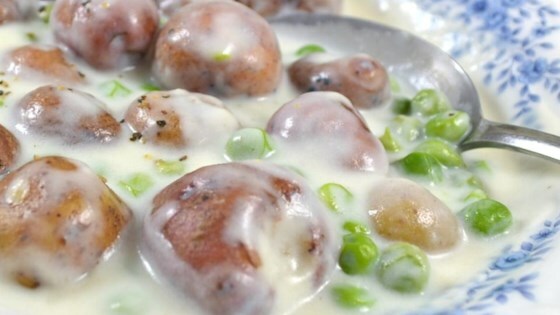 "Just a recipe a local farmer suggested to me to use with his potatoes and peas. I slightly modified it and it's very tasty." Bring a large pot of water to a boil over high heat. Boil potatoes for 15 to 20 minutes, or until tender. Drain. Using the same saucepan, melt butter over medium heat. Stir in flour to make a thick paste; gradually whisk in milk, stirring constantly until slightly thickened. Season with salt and pepper to taste. Now add potatoes and peas to the sauce; simmer for about 5 minutes, stirring often. Serve immediately. See how to make perfect roasted red potatoes the easy way. One pound fresh peas in pods is equivalent to about 1 cup shelled peas. Add a couple tablespoonfuls of minced white onions to the melted butter and sautee them until soft. Continue with the rest of the recipe and you may even like this yummy recipe even better! This was so good!!! I made a large pot and then had leftovers and they were equally good!! !